Spring Sale! 20% OFF & FREE SHIPPING on all Westland Boat Covers and Bimini Tops until April 30th! Same day shipping on in stock tops. Tops not in stock are made in 3-5 business days. Fittings come in both high grade nylon or stainless steel. Aluminum tubing is standard on Westland Bimini tops. All fittings and tubing are rated for travel. 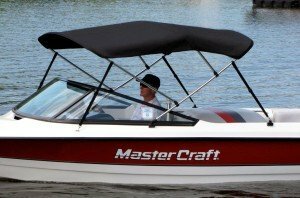 You can use your boat with the Bimini top deployed as long as you have it properly installed and adjusted. Westland Tops are available in Sharkskin or Sunbrella and come in many different colors. If you don't know what size you need, that's okay because Westland has many sizes already applied to boats. Many of the most popular sizes are already in stock and, if not, they can be made and shipped quickly within 5 business days. Sunbrella® is 100% Acrylic and weighs 9.25 oz per square yard. It's water repellent, breathable, and UV resistant. Sunbrella® is available in 20 colors and has a 10 year warranty. Sharkskin SD Supreme is a 7.5 oz. polyester material that is solution-dyed to retain its color and remain consistently vibrant. This is one of the top-selling Bimini top materials offered by Westland as it's affordable, durable, and carries a 7-year warranty. Available in the following desirable colors: Black, Seagull Gray, and Caribbean Blue. Sharkskin Plus is the lightest material we offer at 6.5 oz per square yard. It is an acrylic-coated polyester, which can be described as light in weight but very durable. Sharkskin Plus is very water and UV resistant. This material has a 5 year warranty. Westland's Bimini tops can be conveniently mounted on any surface thanks to the swivel design of their deck hinge. The deck hinge is the main mounting point of the Bimini. Its ability to swivel will allow you to mount it on a 45 degree surface as easily as it will allow you to mount to a surface with an angle of 90 degrees. 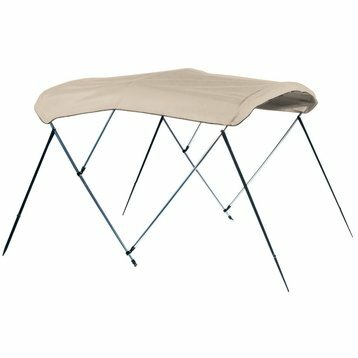 This versatile piece of hardware is key to ensuring the Bimini top can be used in multiple applications.